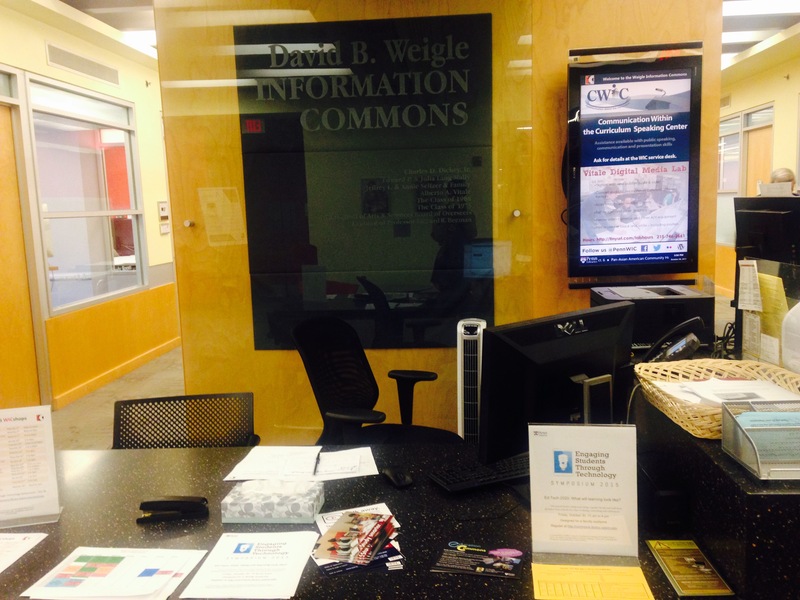 From basic directional questions, to more in-depth technology troubleshooting, we get asked a metric TON of questions at the Weigle Information Commons front desk. So we’ve decided to digitally compile our top ten most frequently asked questions (and answers!) at WIC. Always wondered where the bathroom is on the 1st floor? Spoiler alert: There isn’t one. It’s a crazy design flaw, we know. New student and unsure how to book one of our ever popular Group Study Rooms? We’ve got you covered. Read on! Q1: Where is the nearest bathroom/is there a bathroom on this floor? Q2: Where is the nearest water fountain? A2: If you’re walking into WIC from the front entrance, keep going but stop before you hit the Vitale Digital Media Lab. The water fountain will be on your left. It’s a fancy eco-friendly water fountain too! Q3: How do I reserve a GSR? A3: Easy! Go to WIC’s website (commons.library.upenn.edu) and hover over the tab on the top left of the page called “Study Spaces”. Click the top link that says “Group Study Rooms” which will lead you to a page that lists all the rooms available to reserve at WIC (and the Education Commons) along with links to LibCal where you can see what rooms are available on which days, and book the room you want. Helpful tip: If you go through the booking process and don’t receive a a confirmation email, it didn’t work and you should try again. Q4: I’m trying to reserve a Group Study Room and the system is telling me I’ve reached my booking limit even though I haven’t. What do I do? A4: If you go through the booking process on our public look-up station and aren’t prompted to enter your PennKey, you will need to clear the browser you’re using before continuing. If you don’t, the booking won’t work, and will give you an error message. This error message ultimately means that you’re logged in as the person who booked a room before you, and they’ve reached their booking limit. Q5: Do I have to reserve a booth? A5: No. However, reservations are advised because if someone reserves the space you’re currently occupying, they can (and often will) ask you to relocate. Q6: Which computers have which software? A6: When we get this question, we usually direct people to this super helpful LibGuide: Computer Labs, Laptops and Software in the Libraries. The guide will tell you the locations of the software you’re looking for (building location as well as machine location), media player information and hardware peripherals available (i.e., paid laser printing, or PC scanner). If you’re looking for software information outside of Penn Libraries, try visiting this Penn Engineering resource! Q7: Is it possible to reserve a room for a large group of people? A7: It is! If you’d like to reserve a room for a larger group of people than our study rooms can accommodate, you have a few options. WIC Seminar Room is often used to teach classes and seats up to 35 people. The room includes 20 Mac Laptops, several PC laptops and a high-definition videoconferencing system. Additionally, The Collaborative Classroom is an active learning space located in room 113 of the Van Pelt-Dietrich Library Center. Designed for problem-solving activities, the space contains 5 tables and one instructor station, each with a projection screen. Whiteboard and glass walls surround the room for 360 degrees of writable surface. The room seats 30 and is available for both course instruction and for individual events. Contact Catrice Barrett with any questions about the room at collabclass@lists.upenn.edu. Q8: Where do I go to rent out equipment/pick up equipment I’ve rented? A8: To rent equipment, go here. To pick up rented equipment go to the Vitale Digital Media Lab. To get there from the library’s front entrance, head straight back towards WIC until you get to the last door on the right! Helpful hint: Never reserved equipment before and unsure where to begin? No worries! For more information on the online equipment lending process go here. Q9: How do I use the BookScan Station? A9: The BookScan Station includes a sheet feeder and a large-format scanner, both connected to an easy-to-use touchscreen monitor which allows you to email scanned files, upload them to your Google Docs account, or save them to a USB drive. Please note, you must have a PennKey login to use the equipment. Click here for more in-depth information about the BookScan Station. Q10: How do I use the single-sheet scanner? A10: WIC has created a single sheet scanner tutorial to answer just this question, which can be found here! So there they are, the top 10 most frequently asked questions at Weigle Information Commons. Hope this helps! Didn’t see a question you wanted answered on the list? Leave a comment below, or feel free to email us anytime at wic1@pobox.upenn.edu and we’d be more than happy to help!